Handy Handout #416: What is Reading? What Happens When We Read? What is Reading? What Happens When We Read? Reading is a sound-based activity that requires a foundation of the mastery of sounds represented by letters and letter combinations on a printed page. Successful readers can decode (translate) letter symbols and their combinations into sounds that represent oral language. If children have trouble translating letter symbols orally, they will likely experience significant difficulty in learning to read. Developing strong letter recognition and letter/sound correspondence is critical to becoming a confident, fluent reader. As mentioned above, we must be able to recognize letters – their names and distinguishing features (straight lines, loops, etc.). Alphabet knowledge, especially in young children, is the key to reading success. Associating each letter and letter combination with the sound it represents is especially important in developing phonemic awareness. 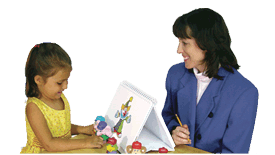 Phonemic awareness is the ability to hear speech sounds and blend them together to make a word. Learning to read requires hearing speech sounds at the same time we see the letters or letter combinations that represent those sounds. If the sounds are clear and the child sees the letters clearly, he/she has a greater chance of retaining the sound-to-letters connection in his/her memory. Research indicates that children who see letters and words while hearing their sounds develop stronger reading skills. How do children develop alphabet knowledge? Play with picture alphabet blocks that have a pictures representing the letter sound (K – key). Read. Read. Read! Reading books aloud makes the sound representations of the letters, letter combinations, and words more distinct. Reading aloud to children also teaches them that print carries a message. Help the child learn to write individual letters of his/her name and other letters seen in books, environmental signs (Stop, Restroom, Railroad, Pull, Push) and familiar packaging print around the home (Pop Tarts®, toothpaste, soap, etc.). Call attention to the letters and sounds when the opportunity presents itself. Sing the alphabet song while looking at and pointing to the letters. Provide practice for writing the letters. Help the child trace letters in shaving foam, sand, rice, etc. Let the child write the letters on unlined paper first. Use paint and brushes, finger paint, pencils, and crayons. Play with alphabet flash cards that include pictures of items beginning with that sound on each card. Make individual letter cards of upper and lower case letters. Match the two letters and talk about the sound(s) they make. Associate items that begin with that sound. Select a letter for the day and write it on a large card. Have the child find and circle the letter and words that start with that letter from children’s magazines. Help the child cut out the words and encourage him/her to add drawings. Conduct a letter search. Have the child look through the large print in newspapers or children’s magazines and circle the letter they are working on when they find it. Find capital B or lower case b, etc. Write a series of simple words on a piece of paper, for example, boy, ran, back, fun, box. Ask the child to find and circle the b in each word. You’re making progress when the child recognizes on his own that some words you presented do not have b in them. Once children develop alphabet knowledge and phonemic awareness skills, they are ready to put the two together and begin reading. As they develop this process, seeing the letters, letter combinations, and knowing the sounds associated with them will help them blend all of this together to form words, sentences, and stories.